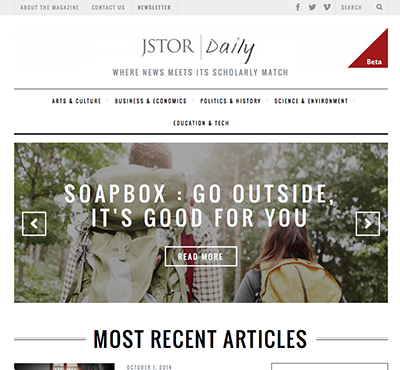 Launched this summer but just announced today (still in BETA), JSTOR has created a “news meets scholarly research” type blog called JSTOR Daily that highlights some of the latest in research and scholarly articles that often get buried in an overwhelming mountain of information. Held behind a secure log-in, we often just ignore the great resources that JSTOR has to offer until we are looking for something very specific. The newly launched JSTOR Daily provides a more digestible form, and already features over 100 shorts with links back to the deeper articles. Even more useful, the writers of the blog summaries and short articles also link back through their bibliography to the JSTOR sources. For both students and faculty, this is quite a boon in ease of searching for relevant articles for research projects. Side note: Most people who work or are enrolled at educational institutions in the US will have access to JSTOR from both on and off campus. But if you’re neither an employee or student of an educational institution, Mott – like many other public educational institutions – does invite members of the public to get a community library card for certain limited access privileges, which can include JSTOR from a library computer.